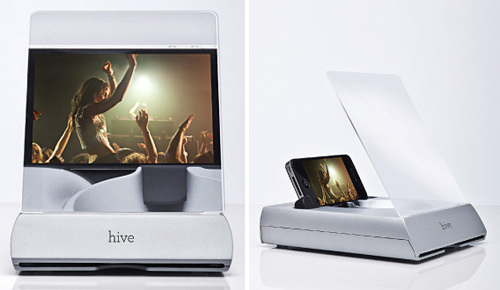 Hive iPhone Dock – Bigger Sound, Bigger Screen, No Wires | OhGizmo! Another unpowered iPhone amplifier? You betcha. But instead of attaching to your bike’s handlebars, this one’s designed to simply sit on a desk. And instead of just amplifying the sound coming from the iPhone using a specially engineered scoop, the Hive also doubles the size of its display using a Fresnel lens. It’s a unique alternative to going the iPad route, and certainly considerably cheaper, but I think they’ve got a tough sell on their hands. I have no doubt it works as promised, but I’m not sure if I can see myself using it instead of just holding the iPhone closer to my face… But if it’s already struck a chord with you, head on over to Kickstarter and back it since they’ve got a long way to go to reach their $150,000 goal. The iphone dock is really making a buzz around the world.